AFRICANGLOBE – If Boko Haram were a government, it would be Sudan. A distraught and desperate husband who traveled from New Hampshire to Sudan has been allowed to visit his pregnant wife on death row, only to find her shackled in chains. 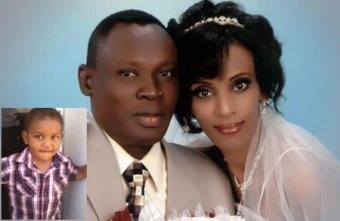 Meriam Ibrahim, 26, was sentenced to death last week by a Sudanese court in Khartoum after being convicted of apostasy. The Christian woman, who is eight months pregnant, had refused to denounce her religion. Her husband, Daniel Wani, arrived in Sudan Monday after leaving New England. The couple’s 18-month-old son, Martin, is with her in prison. Martin might be an American citizen. But don’t ask the State Department about that. The U.S. State Department on Monday declined to say if Martin Wani, a 20-month-old Christian boy imprisoned by the Islamist Sudanese government, is a U.S. citizen. “You don’t know whether that little boy in prison is a U.S. citizen?” CNSNews.com asked State Department spokesperson Jen Psaki at the department’s Monday press briefing. “I don’t have any more details to share,” Psaki said. But if things get real bad, Psaki might break out a selfie and a hashtag. Meanwhile a toddler remains in a Muslim dungeon. The 20-month-old spends his days sitting next to her in their cell while Meriam, who is eight months’ pregnant with her second baby is held in shackles. It can also be disclosed that in her cell she has been left to bleed by the guards, she is being given no medical attention and is having to eat prison food which is not giving her the nutrients she needs for her unborn child. Her family are growing anxious as her first birth was difficult and there are fears the second could be fatal if she goes into labor in such barbaric conditions. Meriam was thrown in jail in September and earlier this month was sentenced to death for adultery for marrying Christian Daniel Wani, a Sudanese man with US citizenship who lives in New Hampshire. Gabriel said: ‘Meriam is in a bad condition, she is eight months pregnant. She needs proper medical attention and she needs medical supplies. She’s bleeding and nothing is being done. Islam. The religion of mercy and peace. Previous articleAre You What You See or Are You What You Want To Be?